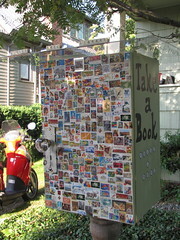 The side of the Little Free Library says, “Take a Book / Share a Book.” Photo by Wendi Dunlap,. A new library — a very tiny one — sprouted this weekend on 16th Avenue South, near Jefferson Park. It is, as far as we know, Beacon Hill’s first Little Free Library, part of a movement to build small library structures in communities around the nation. Little Free Libraries are usually small boxes or cupboards mounted at streetside like mailboxes, and typically built and maintained by neighbors to promote literacy, community, and the enjoyment of reading. The Mas family library is charmingly built from what looks like a former kitchen cabinet, roofed with plexiglass, covered with a collection of foreign stamps, and opened with a vintage doorknob. Inside are two shelves of books, some bookmarks to borrow, a request list, and a guestbook for visitors to sign. Books are free to borrow. 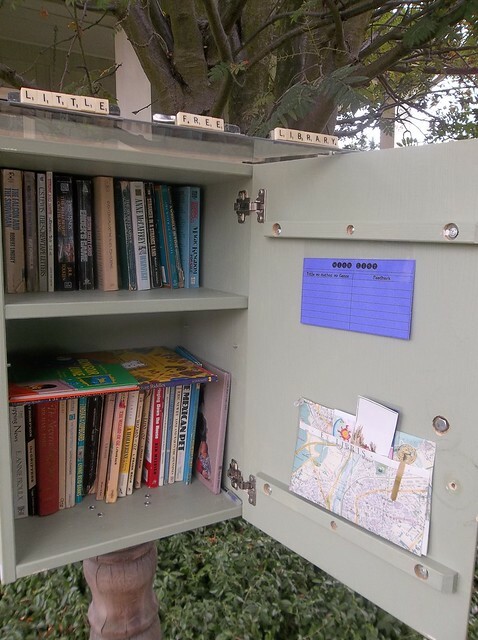 The inside of the Little Free Library has a request sheet, bookmarks to borrow, a guestbook, and — oh yes — books! Photo by Levecke Mas. Can we donate to the library? Usually with Little Free Libraries you can leave a book there when you take one if you want. If you want to donate more, I guess you can probably leave a note for Levecke at the library and ask. A neighbor across the street from Maple Park has been doing this for a few months too. His is lower tech; just a crate on a tree, but he does seem to pull the books inside when it rains. Thanks BHB for posting the story. @Nikki- Yes, you can certainly donate! When you come by, I hope you find something you’d like to take in exchange. I agree with Wendi-if it’s more than a few books, send me an email and let’s chat! Cool! Read about these in the newspapers or somewhere and thought about how many books I could share! The Little Free Library is a such a great idea!! FYI, there is now another Little Free Library on Lafayette, between Horton and HInds. Thanks for letting us know, Dave! I know of another one in the works, but I’m not sure when it will be finished.